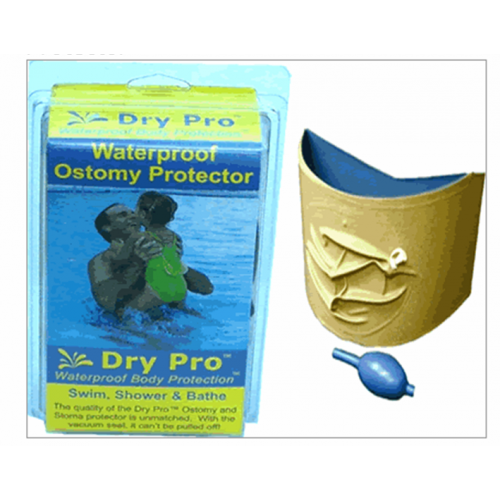 Waterproof Ostomy Cover, manufactured by Dry Pro is a waterproof ostomy cover that goes through an allergen reduction process. 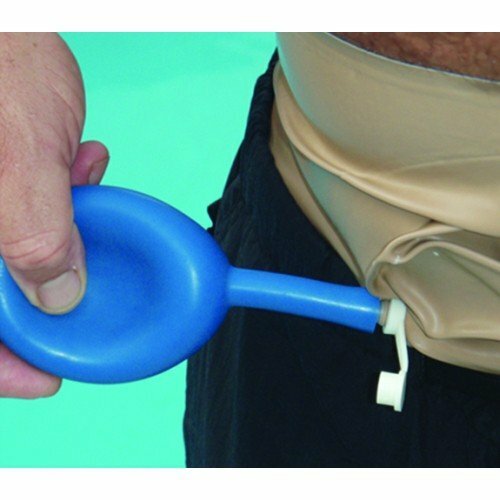 This cover is designed to keep bacteria and other contaminates away while allowing the user to bathe or swim keeping the ostomy site completely dry. Stretch the protector over the ostomy or stoma until the site is completely covered, with at least an additional inch on either side. The top and bottom opening should be smooth and snug against the skin. Slide the protector over the body until the site is completely covered. The Dry Pro should fit snug and comfortable on the body. The opening should be flush against the skin. Continuously press the pump until it becomes flat. Remove the pump and push on the safety cap. After you pump out the air, observe the protector for five minutes to make sure it remains wrinkled and completely sealed. Slide off- When you are finished using, simply lift up the cuff to let the air back in. The Dry Pro should now be loose. Simply slide it back off. The Dry Pro can be rinsed or cleaned with soap and water. Do not leave the DRYPro on for extended periods of time. Dry Pro recommends removing it after every 45 minutes of use. Do not use in vascular compromised patients. Steady yourself in wet slippery areas. Always follow your doctor's advice. Will your Dry Pro waterproof ostomy protector work for a patient that has a urostomy? He wants to swim in the pool for 20-30 mins daily. We do not employ any medical professionals and therefore cannot answer any specific questions regarding items sold. It's best in this case to contact the manufacturer of the product for further details on the durability of the product in the given conditions. Could I use this over a colostomy bag? I have been using the Dry Pro ostomy protector for several months now and originally was very pleased. The order I recently received for 2 of the medium size is not the same quality as the ones I have purchased previously. The material is thinner than before and they are cut almost 3/4" narrower. They tend to roll down at the top and bottom edges and do not seal near as well as the ones purchased in the past. When I brought it to the attention of Vitality Medical they requested photos to show that i received what i was supposed to. I do think I know what I have used. I'm doing my best to make the new ones work but they are just not as good.